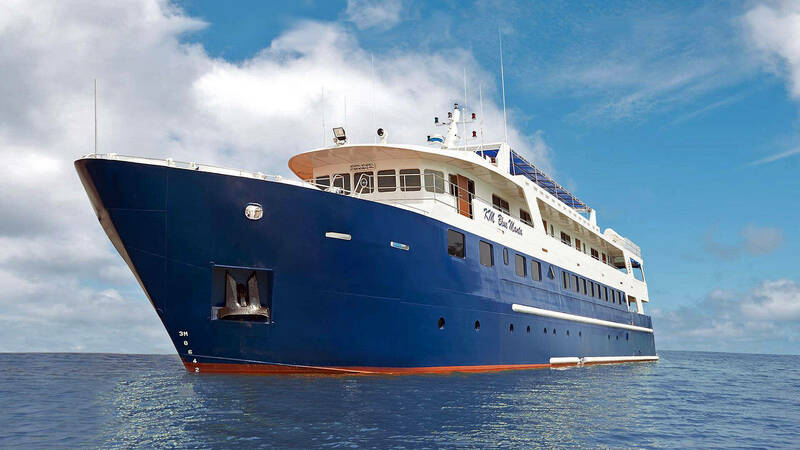 Welcome to MV Blue Manta, a new luxury Indonesia liveaboard, she started running trips to Komodo and Raja Ampat in late 2015. The Blue Manta is probably the largest dive vessel in the region. With a length of 45m and a beam of 9m, Blue Manta is a steel hull boat and will only take 18 guests. There are 14 beautifully furnished en-suite cabins, each one 20 square meters in size. There is also an open outdoor alfresco dining area, and an indoor air-conditioned room for dining. 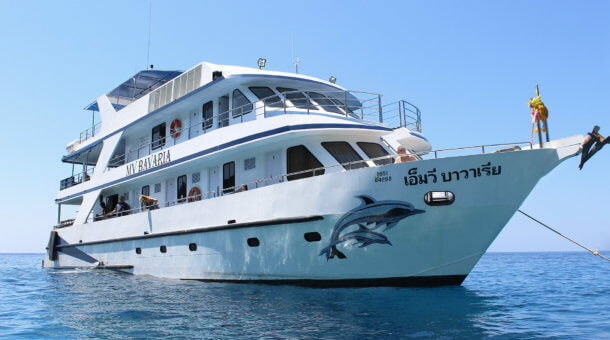 Blue Manta is one of the very best liveaboards in the region. NOTE: Blue Manta has many different trips, trip lengths and special trips. Check the schedule below for a full list! The Blue Manta is built with steel designed to withstand the hardest sea conditions, offering the stability wooden boats cannot. The 9m width and weight of 400 tonnes add to the steadiness. Built for sea-worthiness, the Blue Manta operates on twin engines and is an ultimate dive vessel for long haul cruises and blue water crossing trips. 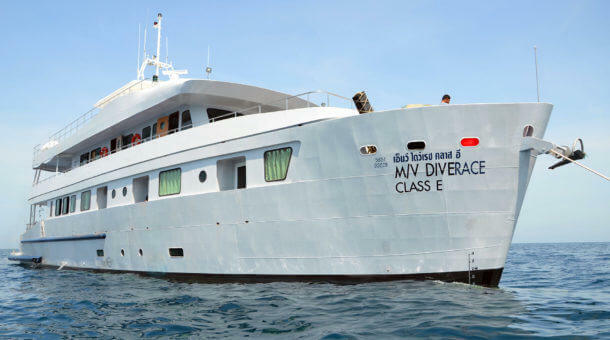 She is dependable for comfort, convenience and a stress-free dive holiday. Blue Manta takes only 18 guests. There are 14 beautifully furnished en-suite cabins, each average 20 square meters in size comprising of single cabins and twin/double cabins. 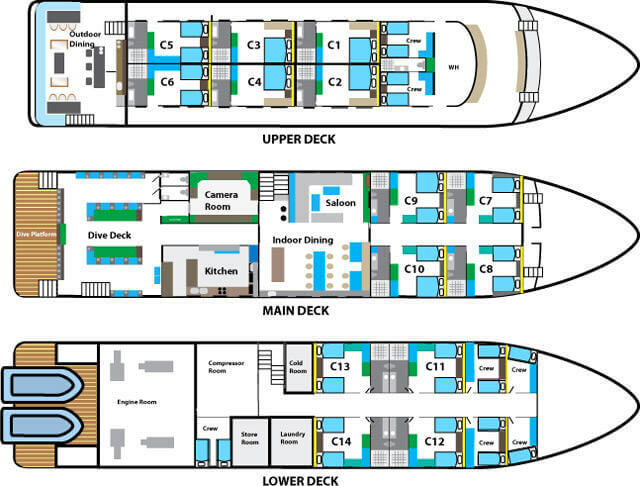 There are 6 cabins on the upper deck with window, 4 cabins on the main deck with window and 4 cabins on the lower deck with a port hole. Blue Manta has all safety equipment including 2 life rafts, 4 chase boats, radar, GPS, oxygen. There is a crew of 22 on board. 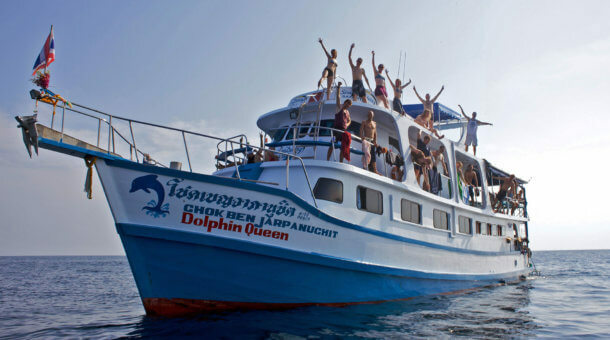 The boat is equipped with camera-friendly facilities, designed for the most avid underwater photographers. There are individual rinse tanks, a large outdoor work table and an indoor dry camera room. Food is very important too. On the Blue Manta you can start your day with freshly baked bread. With no less than 5 meals a day, you will be filled and satisfied with an extensive range of treats for your taste buds. WiFi is connected via satellite and with a 24/7 WiFi connection, you can be connected with your family and friends anytime, anywhere. Nitrox is available on board @ 15 US$ per diving day or 5 US$ per individual fill. 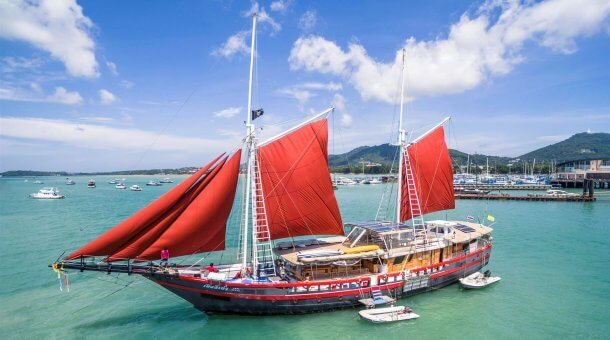 Blue Manta has a highly varied schedule consisting of trips in several locations and with trip duration from 6 to 12 nights departing from Sorong, Ambon, Maumere, Labuan Bajo and more. Please do check the full schedule and send a trip enquiry or simply contact us with your planned diving dates – we can suggest a trip and send you trip details and a full itinerary. There’s too much information for one page here!